Farfalle is the Italian word for butterfly and is the best word used to describe this shape of pasta, even though it is more commonly known as bow tie pasta. I decided to make my own, and butterfly wings is a more apt name, given how fragile the pasta was. Also, they are not easy to make, they need patience and time and a lot of experimenting went in to making them. You will see this if you look closely at all the shapes and sizes. You need to start with a rectangular piece of pasta – then trim the edges using a ravioli cutter and then lightly pinch the middle together. However, this would be a fun thing to do with kids – you cut the pasta and they do the shaping. I am sharing the sauce recipe as you could use any pasta, but, you will have to have some leftover meat to make this with as I did. I also buy different shapes of pasta to make our meals fun esp when my nieces are visiting. I meant to ask you where could Cin be? Is she okay or she is just busy since this is peak season in her line of work? 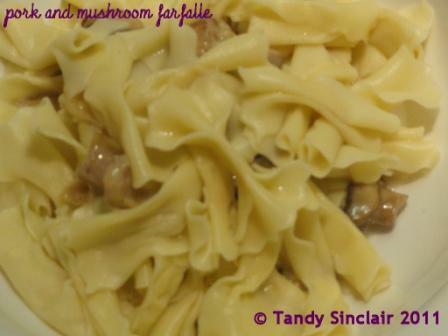 Kudos for making your own farfalle Tandy! Awesome stuff and serious dedication and patience. Wait leftover pork belly? That wouldn’t happen, but hey this looks worth starting from scratch! Sounds really flavorful! Thank you for participating in PPN!